It's Poppies Pat so absolutely love your card. Enjoy the show. What a beautiful design, Pat - those poppies look real! Hope you didn't spend too much at the craft show, hun. Lol. 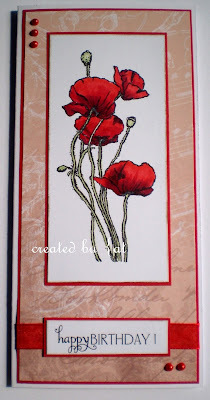 Beautiful card Pat, love the poppies. A beautiful card with a stunning image, those poppies are gorgeous and so beautifully coloured! Hope you enjoyed the craft show, and thank you for your kind comments and concern! nice and elegant, just beautiful! I have that stamp and love it. I never thought of putting it on a tall, narrow card but it looks fantastic, especially with the background paper and red borders. I'm so glad you shared this at ATSM this week. Ooh this is gorgeous Pat… so elegant and classy! it's a fab image and you've coloured it to perfection! Your poppies are coloured so perfectly, they are stunning!! And the background paper is so soft and subtle, really makes those poppies stand out. So very glad you shared this with us at ATSM this week! Gorgeous poppies, beautifully coloured. I have that set but as yet they remain uninked! A favourite stamp of mine, very pretty card. Thanks for joining us at Cardz 4 Galz. Caz DT. Very classy! Thanks for playing at Crafts & Me Challenge. Please pop back for our new challenge of "Spring"